It’s been a singing week. Last Tuesday, I attended a concert given by a duo, Blood and Patterson, with repertoire over two thousand songs, including “Some Enchanted Evening.” “I’m So Lonesome I Could Cry,” “Four Strong Winds” and “Circle Game.” Rather than a mere performance, the show was a sing-a-long reminiscent of what Pete Seeger did post The Weavers. Blood and Rush compiled songs into two books. Now, technically, you may have a point when you assert that you thought Rodgers & Hammerstein, Hank Williams, Ian Tyson and Joni Mitchell, respectively, composed these songs. The couple in question are Peter Blood and Annie Patterson; they legitimately claim to have put their names to these and hundreds of other songs because they have compiled them in two books. Rise up Singing, which published in 1988, and Rise Again, published in 2015. The books contain the words and rudimentary chording instructions for each song. Remember, this book came from 1988. The internet was just a gleam in the eyes of Al Gore. Learning a new song wasn’t as simple as going to YouTube; you had to own the album, tape or CD. Just when you thought that you might be getting a tad too familiar, with the repertoire of Rise up Singing, along comes another 1,200 songs, some twenty-seven years later, in the same format. There are no excuses for lack of selection. A Blood and Patterson sing-a-long. Thus, when my wife and I saw the advertisement for a Blood and Patterson concert at St Andrew’s Church in Picton, we knew we had to go, even if only to thank them for all the pleasure their books have provided to us in our amateur singing exploits. On top of that, it was a fun evening. 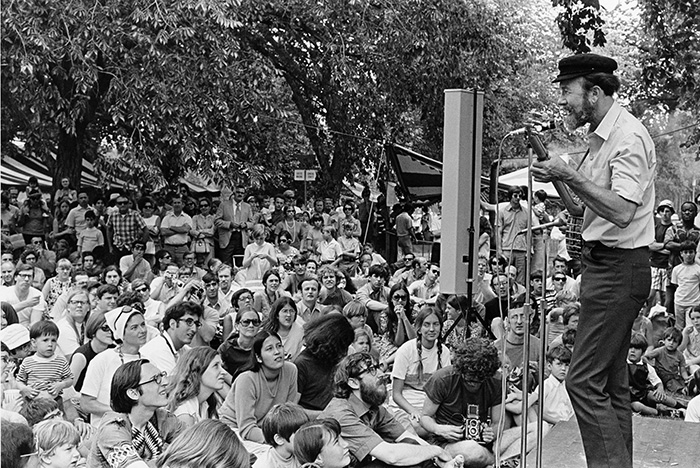 Blood and Patterson are attempting to carry on the tradition of folk legend, Pete Seeger, who would have been 100 years old next May. Seeger was famous for turning almost every song he performed into a singalong. He was heavily involved in the creation of Rise up Singing and wrote the preface to Rise Again. Blood and Patterson sell Seeger CDs at their concerts. All of which made me wonder why there aren’t more public opportunities to just let loose and sing with others. Perhaps it’s because of the prevalence of private music fed directly from the cloud to our headphones. Perhaps it’s because people are less social than they used to be. Perhaps it’s because church attendance has declined. Perhaps it has something to do global warming; everything else does. Two people also trying to buck the trend against letting loose and singing are Tim Falconer and Tyler Ellis. They performed during a session of the “County Reads More” series last weekend. Tim Falconer, who is the current writer in residence at the Al Purdy A-frame retreat in Ameliasburgh, is the author of Bad Singer: the surprising science of tone deafness and how we hear music.” The book explores, in a breezy way, the latest neuroscience of music. Tyler Ellis is a musician and elementary school music teacher. Falconer and Ellis suggest that you can divide people into a minority who feel comfortable singing publicly and the majority who don’t. That majority, in turn, fall into two groups: those talked out of their shyness and those that resist, claiming tone deafness. The supposedly tone deaf include those that can be trained to sing and a small fraction, roughly 2.5% that are amusic. The brains of the amusic meet serious obstacles to taking in and producing music. Still, even the amusic group, Falconer among them, can improve their singing to some extent, with training. As Falconer points out, it is possible for an amusic to enjoy singing, even though it may be hard for both the singer and the listener. Singing aloud is for everybody, even bad singers. Falconer and Ellis decry the emphasis, in music education, on weaning out the less adept, instead of encouraging them. That is the point at which their message converges with that of Blood and Patterson. Singing is for everyone, including bad singers.